Mother's Day is a special time of year set aside to show Love and Gratitude towards mothers and mother figures in our lives! Mother's Day is a great opportunity to thank mothers for all the love, time, care and help they have given us throughout our lives, and for the loving and positive contributions they have made, and are still making, in our families. I am forever thankful to My Sweet Mother - the Best Mother in the World!... for the Wonderful, Loving, Selfless, Christian Mother she was ... and STILL is for me! ♥ Thanks Mom - I LOVE YOU! Many people give their Mom a Mother's Day Card on her special day, along with flowers, or chocolates, or hand-made gifts or, (and I love this one!... ), make "breakfast in bed" for their Mom! Or perhaps make brunch, lunch, dinner or dessert for them! I will always ♥ cherish the "breakfast in bed" surprises our children provided for me...complete with a hand-made menu to "check off" my selections. The sounds coming from the kitchen as the four of them prepared my breakfast are as memorable as the breakfast tray they marched in with. These memories are ones I will never forget...♥ and I so miss those days! If you are planning a breakfast, a brunch or a lunch for your Mother, how about making fresh, delectable raspberry muffins, or irresistible raspberry scones? Or make a special Mother's Day Berry Brunch Cake topped with ice cream or whipped cream? Oh, and don't make her feel guilty about eating anything high in calories on her Special Day! Or, if your Mom likes pancakes, try adding healthy fruit to the recipe, and make "dutch" pancakes, raspberry crepes, raspberry waffles, or french toast. ♥ Heart-shaped French toast or ♥ heart-shaped pancakes are a great idea to show Mom: "I Love You". You could even make them more special by making an easy raspberry sauce to top them! For a VERY simple, but most sweet(!) Mother's Day breakfast or brunch idea, you can add raspberry jam, (or any other favourite jam or jelly), to her toast and say, "I Love You", with the jam arranged in the shape of a ♥ heart...so easy...and so cute! I use a cookie cutter, placed lightly on the toast/bread, and then I spread jam inside, just to help make the shape of a heart. Perhaps you are making a special dessert for your Mother, or a snack to accompany a coffee or tea. ♥ Heart-shaped brownies, a ♥ heart-shaped brownie cake, ♥ heart-shaped Belgian cookies, ♥ heart-shaped Linzer cookies, or ♥ heart-shaped sugar cookies will bring a SMILE to her face! My son-in-law made me these awesome tasting Mother's Day Creamy Lemon Squares with fresh raspberries for Mother's Day. Mother's Day Recipes for dessert and snacks which include healthy fruits, such as raspberries, are always appreciated. Here are hundreds of dessert and snack ideas for Mother's Day Recipes, including cakes, pies, tarts cookies, and more! Are you having your Mother over to your home for dinner on Mother's Day? If so, why not include a ♥ mixed raspberry salad, complete with homemade heart-shaped crotons? Raspberry salads are so very colourful, take a look at the possibilities! Have you ever made a "Chilled Soup"? Try one for something unique to add to your dinner. Chilled soup, or "cold soup", can be served prior to the dinner, or at the end of a dinner (as a dessert dish). A fresh fruit fondue is a great idea for dessert or as an evening snack. Fondues offer an opportunity for relaxed conversation and quality time together with Mom! There are many delicious and novel fruit fondue recipes to choose from. Or, make a fresh fruit tray with her favourite fruits and a scrumptious dip to go with it! 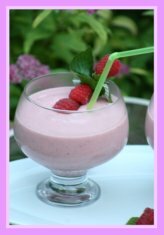 Maybe your Mother is a "Raspberry Lover", why not treat her to a homemade Raspberry Smoothie? There are endless possibilities when it comes to raspberry smoothies, and the other fruits you can include! Does your Mother like coffee, like I DO(!)? Flavoured Coffee gift packages delivered right to your door, or hers, is a great ♥ gift idea for Mother's Day! The ideas for what to use for Mother's Day Recipes are endless. You will find recipes suitable for Mother's Day throughout this entire website. Believe me, the recipes included in my collection are all easy recipes, and even the most inexperienced baker can make them! Most of the recipes also include pictures, so you can see what the end product is supposed to look like! 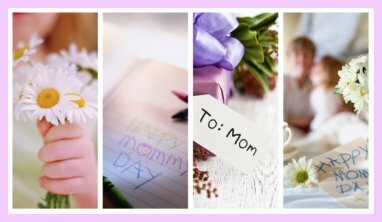 Take a look around, and I am sure something will inspire you to make a homemade food gift for your Mom this Mother's Day using one of these Mother's Day Recipes! Obviously if you want to make smaller, or larger, quantities of any of these recipes, you can simply adjust the measurements, using these handy conversion tools to help you. Looking for more Mother's Day Recipes using fruit?